LaPointe-Fisher Nursing Home has two floors for resident accommodation. Our first floor consists of 44 beds, a dining room that leads out to a sunny deck, a resident lounge, and access to 2 outside visiting areas. Towards the back of the building there is a large lawn with shaded pavilions where activities often take place. Our second floor consists of 48 beds, a large dining room, a quiet lounge, and access to an outside veranda. Each floor contains a nursing station that can be reached by phone 24 hours per day for any care inquiries that families may have. Both dining rooms have large windows to fill the room with natural light. Towards each lounge there is a small inlet that can be set up for a more private dining experience if a family member would like to dine alone with their loved one. All doors in our facility are coded for the safety of our residents. Consists of a four- or three bed room and one shared bathroom. The Ontario Ministry of Health and Long-Term Care establish subsidized rates for our residents that qualify. Consists of a two-bed room and one bathroom. These rooms offer more space and privacy than our basic accommodation. Consists of a one-bed room and one bathroom. This option provides the most space and privacy but is also the most expensive. LaPointe-Fisher is a family owned and operated long-term care home located in Guelph, Ontario. Our nursing home provides 92 beds and offers a variety of services including physiotherapy, recreation programs, delicious food and more. Our nursing home is proud of our Accreditation Certificate which recognizes excellence, quality, compliance, accountability and value. We warmly welcome you to book a guided tour of our nursing home with a member of our management team. 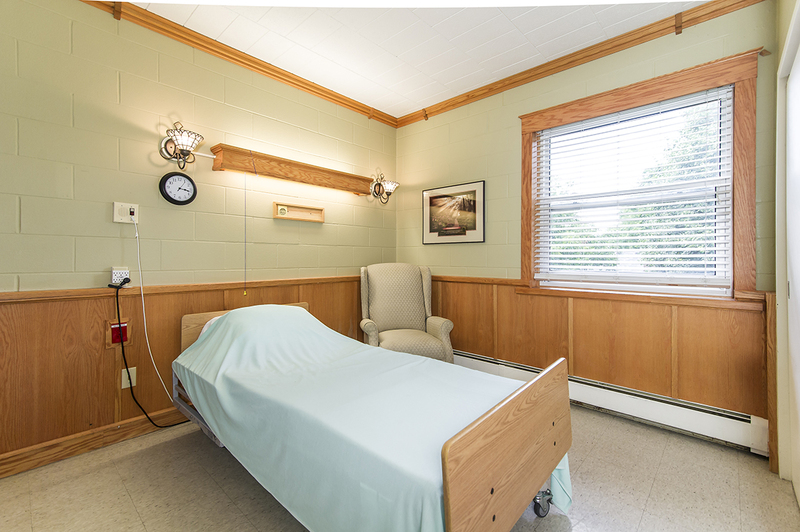 Our nursing home offers 3 types of accommodations, common to most long-term care facilities in Ontario. Our basic/ward rooms contain 3 or 4 beds and a shared bathroom. We also offer semi-private and private rooms which provide more space and comfort at an additional cost.